On Friday, January 19, Meg spent a memorable afternoon teaching a course at Drexel University. The topic of the course was Practicing Emotional Competence. Meg discussed emotional intelligence and the value of understanding what that means to students, especially as they enter the workplace. She presented a number of activities she has developed to help students become more self-aware of their social and emotional strengths. The strategies, activities and resources she shared, along with her own personal experiences, empowered students to find ways to effectively and confidently exercise their emotional competence, which is an integral skill in networking and in life in general. 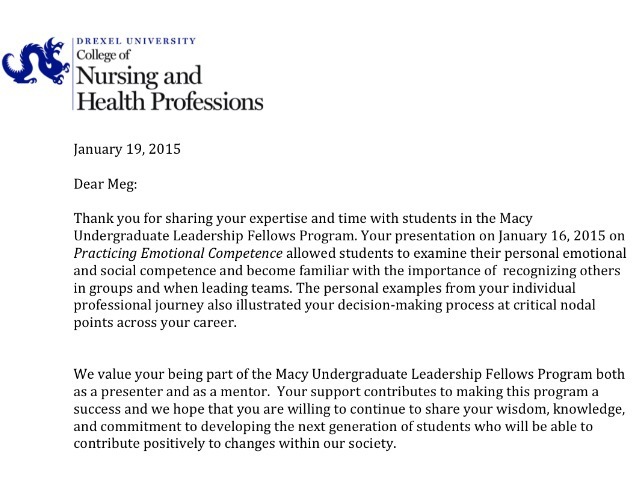 Meg has also been invited to be a mentor in the Macy Undergraduate Fellows Program at Drexel. She’s having a fantastic experience this year mentoring a student in the Behavioral Health Sciences Program.